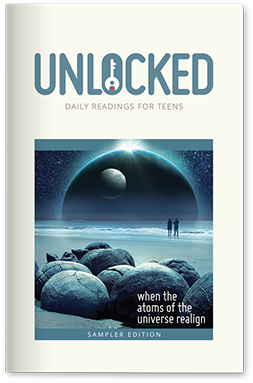 Unlocked is a quarterly devotional for teens featuring daily readings centered on God’s Word. Each day’s reading—whether fiction, poetry, or essay—asks the question: How does Jesus and what He did affect what we’re talking about? With daily readings designed to encourage discussion and a deeper walk with Christ, teens are encouraged both to engage with the Bible and to write and submit their own devotional pieces to Unlocked.